Courage and spirit are most certainly what’s needed for this race that is a true test of strength and true grit by all that venture to even the start line. 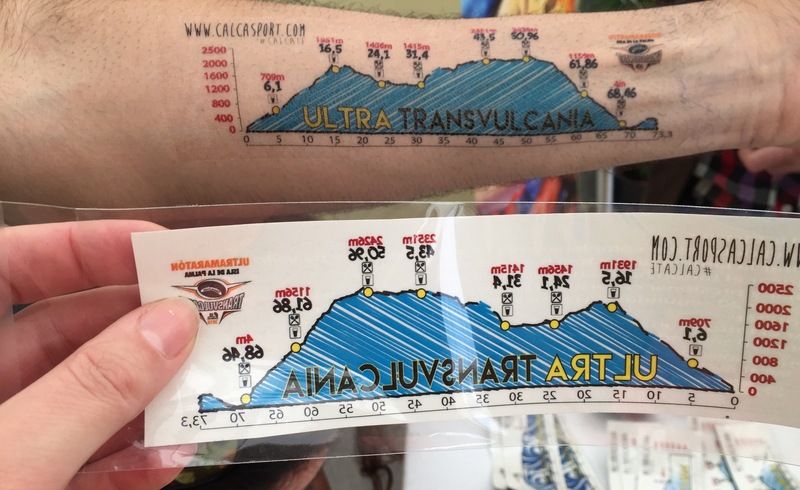 Transvulcania is a 73.3km single stage race set on the volcanic island of La Palma, with 8,525m of climbing, reaching its most vertical point at Los Muchachos at 2,426m (57.8km into the race) with temperatures in the 30’s it tests the body’s ability to cope with both heat and altitude whilst pushing quad & calf burning climbs and descents. But it’s precisely the brutality of the race that makes it all the more rewarding. To be fit enough to be able to enjoy this experience of exploring this stunning island on foot and finish the race is reward enough. 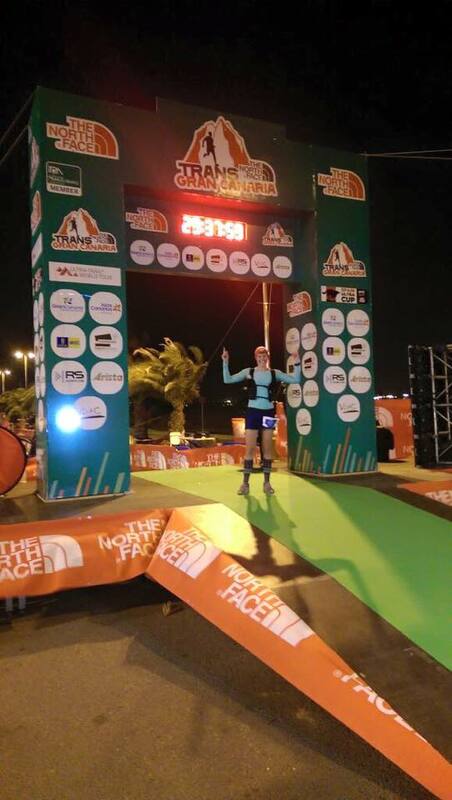 After having run my first mountain race in March, Transgrancanaria, finishing just half hour an hour before cut off my goal was to finish this race strong and well before the cut off time of 17hours. I had 3 goals in my head before I started as I think for a race of this magnitude whilst you want to be positive you also need to be very realistic, so I planned for either a 10.5 hour finish, 12 hour or 14 hour finish. Failing any of that I would of course take a finish! 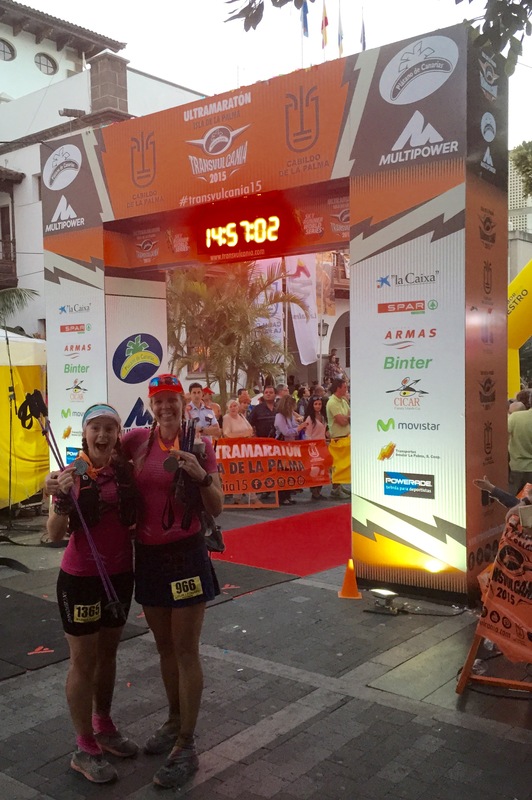 Having learnt some lessons from TGC(read my blog here), I came armed to this race with poles. I had always looked at them as cheat sticks which is the reputation they have in the UK and are even banned in a lot of races, but in Europe they are widely accepted and encouraged and if they’re all using them then it’s good enough for me. I’m not entirely sure of the science and actual percentages to back it up but they are there to help your posture and muscle preservation by distributing the weight better, giving you better stability and when all else fails you can lean on them when you are exhausted! I would not have made it down the final descents in one piece without them and now swear by them for mountain races. I used Mountain King Trail Blaze which are super lightweight and fold up nice and easily for easy stashing, not that I stashed mine I found them quite easy to run with as well. Some of the runners could use some lessons in pole etiquette though, be mindful of people swinging them about randomly, stabbing and/or tripping you up. Poles were the only thing I changed from TGC as I am pretty set on my usual kit which is listed below. 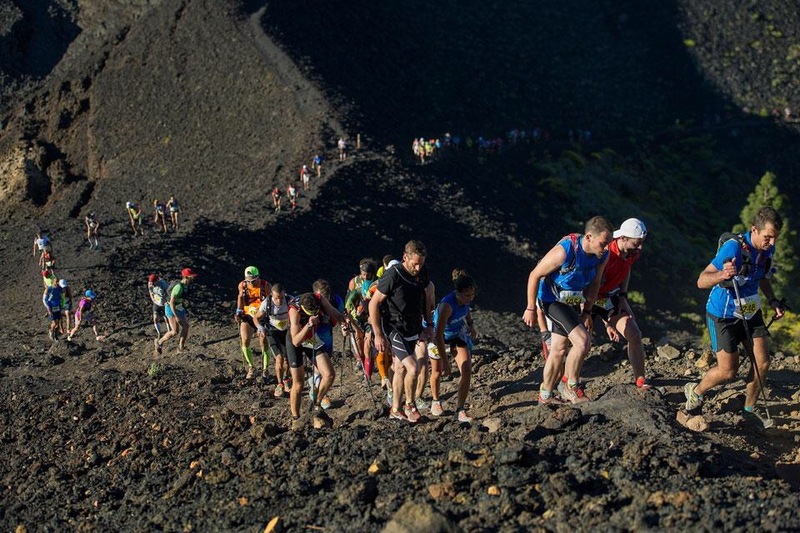 The race itself is great value for money with the entry fee at 90 euros. Obviously the costs add up with travel (my flights were about £350 all up, accommodation (60 euros a night shared) and extras of course. It’s not the most straight forward place to get to so wherever you fly from you are going to have to connect. I flew with Ryan Air from Edinburgh to Tenerife South, bus up to Tenerife North and then across to La Palma on a local flight. 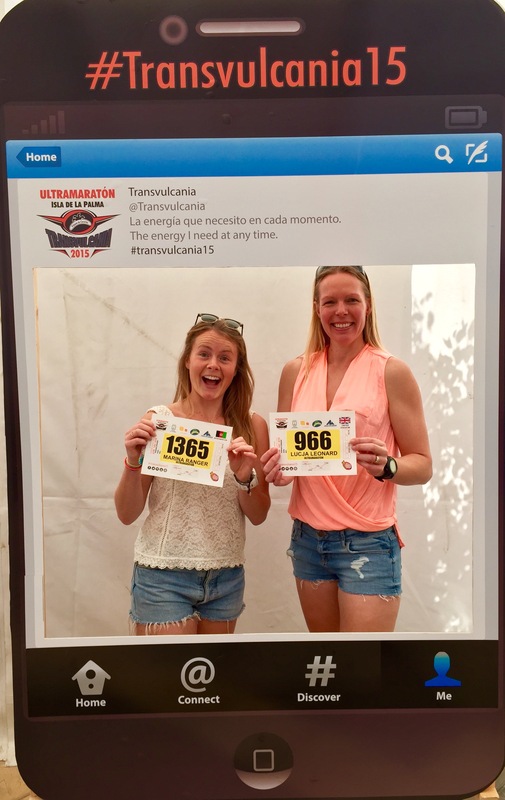 This was a girly holiday with fellow gal pal ultra runner Marina Ranger and we decided to stay in Los Llanos which was also the location for the pre race registration and most importantly the finish. Registration was simple, open for 3 days prior it was relaxed and not too busy with no queues, quick and easy we showed some ID got our number and spent some time checking out the expo stands, of which we both purchased the race tattoo which was really helpful throughout the race to check what was happening with the elevation and when your next checkpoint would be. The last thing you need after a massive race is logistical problems to get to your bed so the plan to stay there worked well, though if I came again I would probably plan to leave Los Llanos and move to Tazacorte the following day as the beach is there, but saying that the regular buses were only just over a euro to get there and our apartment (Apartment Adjovimar) was fabulous, with a great little pool and out door area for relaxing in, popular with runners as it is only 1km from the finish I would ensure you book early. The beauty of an apartment is being able to have a fridge and prepare your own food which is handy for that early morning 3am taxi to the start line and of course post race food. Cheese & prosciutto rolls for breakfast did the job and super noodles with a recovery shake and a beer chaser were the order of the day once we’d finished. It’s always imperative to have the post race food organised as believe me the last thing you feel like is going out or finding a shop to buy food. The organisation has buses that leave at 3am from Los Llanos bus station to take you to the start line however we decided to get an extra hour in bed and share a taxi which was 45 euros between us. The race starts at 6am so it’s still dark and a bit fresh but I decided to tough it out in my race kit rather than taking any extra layers, but a bin bag would have been nice! Superb atmosphere to start and the place was rammed with runners, we headed down to the start line with the intention to get ourselves in closer to the front but it was so rammed we ended up probably three quarters in the pack. 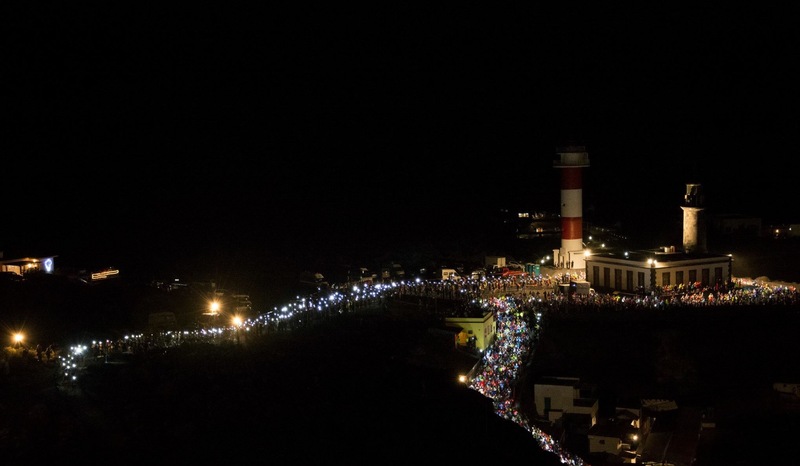 The race kicks off at a charge around the lighthouse and then it becomes very narrow very quickly bringing the pack to a crawling pace. You have no choice but to be patient, conserve your energy and keep out of harms way as there a people pushing and shoving with poles everywhere, the main objective is to keep moving forward and not fall over. A few runnable sections but most of the way to CP1 is a walk. I get there in 1h19 for 6.1km climbing 709m, I made sure I ate (marzipan balls with fruit & nuts) whilst walking, sticking to one item per hour to keep the energy up whether I feel like it or not along with a salt tablet every hour. The CP is busy and the crowds are tremendous, the whole village at Los Canarios has come out! 2nd CP is another climb of roughly 1,200m over 10km which takes just shy of 2hrs, again this is mainly a walk with some running in patches. The big crush – me in pink! The next 8km to CP3 El Pilar are my favourite, dropping gently about 500m it is on beautify pine forest trails where you can really get a wriggle on, I do this in about an hour and you can hear the aid station a good 10mins before you get there, music blasting and plenty of crowds to cheer. This is the start location of the marathon which started at 9am and finishes in Tazacorte, it is also the finish line for the half marathon that starts later in the day from the lighthouse. From El Pilar it’s 19km of what looks like flat on the elevation profile for the first 7km to a minor aid station and then another 10km of uphill to reach Pica de la Cruz and takes me about 3hrs. Again all the while eating, having finished my marzipan for my first 3hrs it’s time to switch to gels. There’s some mistake here on the details and the checkpoint ends up being 4km further which means I, and many others run out of water, a mistake they have already announced they will rectify for next year. I survive, and I mean survive as the heat is really bearing down on us now and altitude is causing everyone to struggle for air, with many including myself stopping regularly enroute to get the heart rate down. I ask 2 separate passer-bys for water which thankfully they give as I’m dry and pretty disturbed by the amount of people I have seen so far vomiting and/or passing out and being stretchered off. 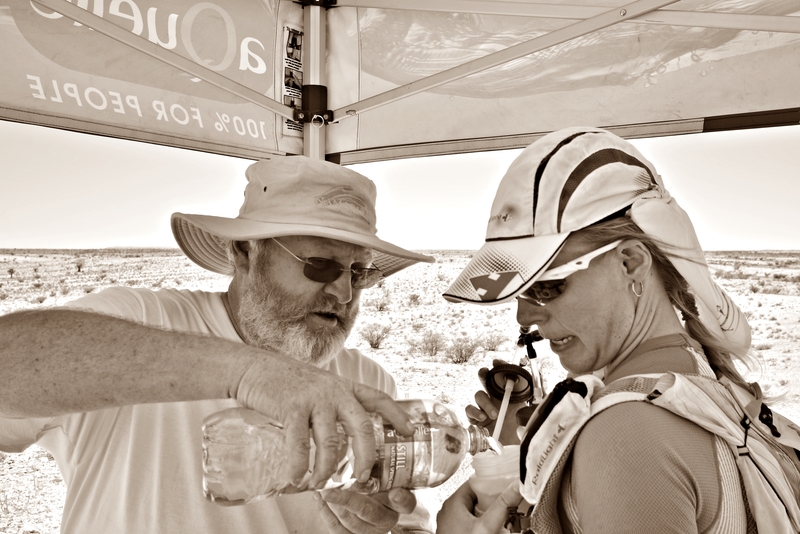 The medical support is everywhere though and they are talking to each and every runner to check with are ‘bien’ – good. Yes 👍’great!’ I keep responding! I make the CP, thinking it would be Los Muchachos already but alas it’s not, that’s another 7km to go taking us to the highest point of the race. 2h20 to do 7km! It’s a slog, but at no point do I consider its too tough for me, I’m hurting but loving every minute! I just can’t explain how awe inspiring the views are, you are just going to have to see it for yourselves but I will say it’s magical, at one point we were running above the cloud line, it was like something out of a movie and the landscape is phenomenal. Speechless! Or is that breathless from the altitude!? Los Muchachos is busy and I waste no time filling up water and devouring some water melon, orange segments and coke, this is the only food I take from the CP’s to substitute my marzipan, gels and Hammer perpetuem. Eat the watermelon! OMG! So good! It’s 11km with a severe drop of 1,300m to El Time and on legs that are shot already this steep technical descent is murder even with poles (I think I’d struggle even on fresh legs), some people run past me obviously much more confident on this very technical terrain and I reach the CP in another 2hrs. 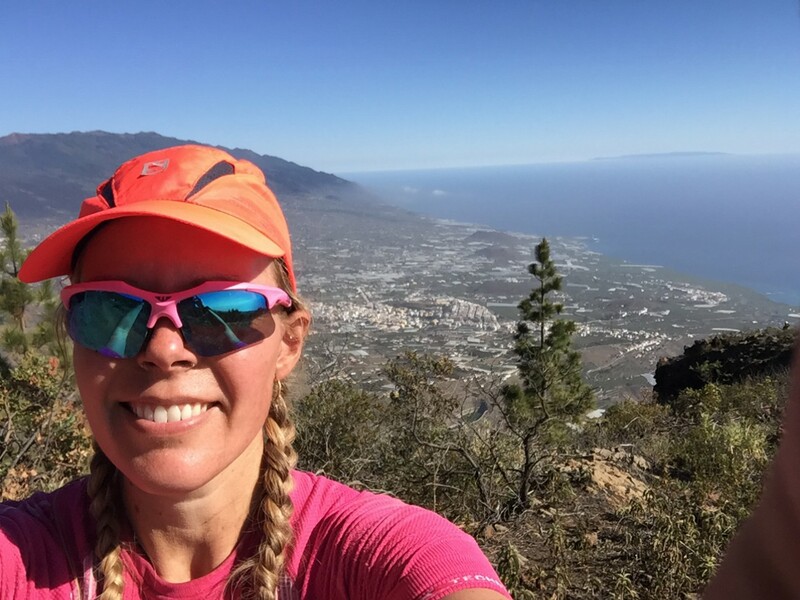 From there it’s the final drop to Tazacorte beach which I have been able to see since we started descending trying to tempt you down so it’s another 7km with 1,150m drop, again mostly very technical so I’m reduced to a hobble but I enjoying running the steep road. There are some crazy drunk locals out supporting offering their homemade wine to runners, I think why not and down a shot at their avid encouragement. I figure I can’t get any slower maybe this is the rocket fuel I need and I reach Tazacorte in 1h 40 to a heroes welcome. The bars are heaving down here and it s a full dance party atmosphere, people are high fiving you and screaming out your name and shouting ‘Animo, Animo! !’ which you hear all along the way along with ‘Vamoos’ (depart hurriedly). The last 5km section takes me 2hrs, aptly named the ‘sting in the tail’ starts with a few hundred metres in a sandy riverbed with about 500m of a nasty climb back up, here I see more people passing out, with Marina telling me later she sees the same guy I saw passed out then being airlifted out! When you finally reach the top, there is a flat road section to the finish which must be only about 1.5km but feels like forever, the street is lined with people and they are all cheering loudly and high fiving you so you can’t walk even though your legs want you too after that last climb. 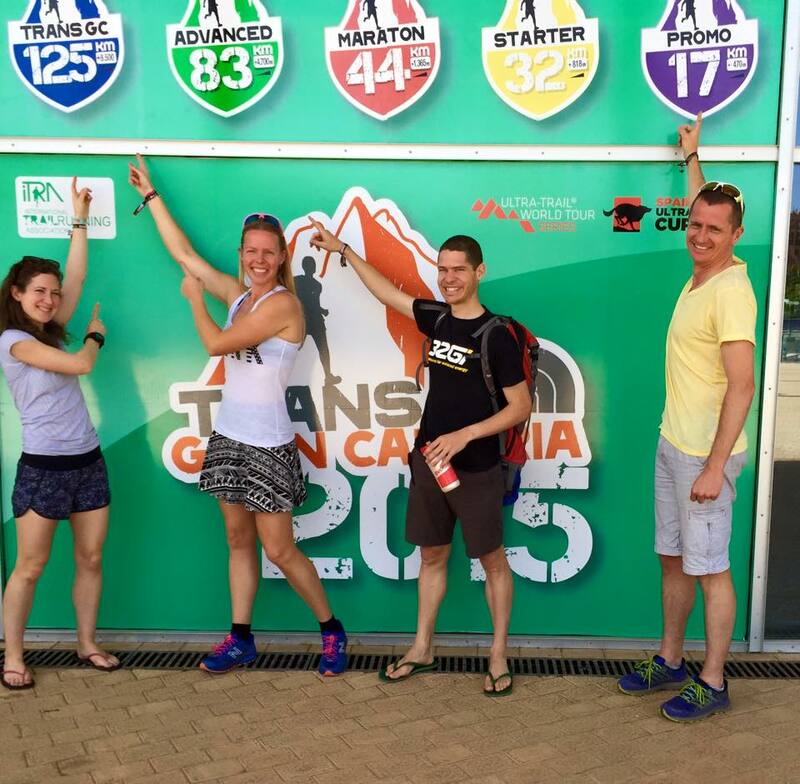 You see the big Transvulcania sign ahead but it’s not the finish that’s another 300m, turn right, turn left and there it is, the red carpet lined with throngs of supporters. I’ve done it, I’m a super legend! High five, high five! They’re all shouting and cheering me on, arms raised I cross in 14h 31min. What a day! I lean on my poles for a second before I spot a bench with a spare spot between 2 finishers, I sit and burst promptly into tears! Emotional the runner beside me gives me a congratulatory hug with tears in his own eyes. It’s not 2 minutes later and my running pal from TGC, Luis, finishes as well. I’m quickly on the phone to Dion I’m so excited I need to hear his voice but it’s so loud there I can hardly hear him, I hear his super proud of me and that Marina is only 20 odd minutes behind me, so I get back to the finish line to see her cross in 14h 54m! So proud of her as she has improved so much over the 7 months I’ve been working with her putting together a specific training plan first tailored to her Kalahari Race last year and then leading up to this incorporating specific training to get her mountain ready. I seem to be training her too well as she’ll be beating me next! We’re elated to be finished before dark, just, and head over to make use of the physios for a quick rub down before heading back to the apartment to get cleaned up and start the recovery process. Sleep does not coming easy that night with our bodies full of adrenalin we stay up chatting for a few hours before a restless sleep on very tired legs keeping us both awake. 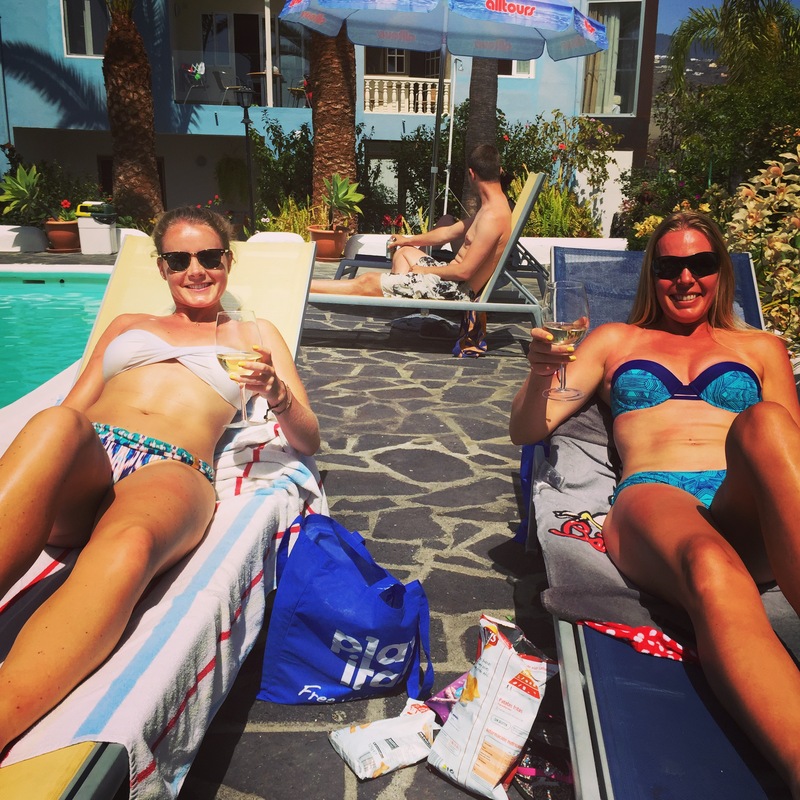 We spend many an hour talking about the race over the next 3 days we have on La Palma whilst enjoying some well deserved RnR. We hire a car to make the trip back up to Los Muchachos to see it with fresh eyes and whilst there go for a little run. We can’t believe the effect the altitude has on our breathing and still can’t believe how high up we were, even the car struggled to get up there! Recovery has been great, the legs feel very good not that I’ve really tested them as yet. I’ve made sure I’ve drunk lots of water, eaten well and spent a lot of time relaxing by the pool with my feet up and a few dips in the pool. Post race I had my recovery shake within about 2hrs of finishing and ate my super noodles before bed. The only difference to my normal routine is that I’ve tried CurraNZ which are tablets made from black currant extract, a high potency anthocyanin/antioxidant superfood which is supposed to aid performance and recovery by reducing muscle soreness. It’s the first time I’ve used them so it’s really hard to compare as this race doesn’t compare to anything (TGC I had terrible recovery as I was pretty much straight on a flight!) but I am feeling very good. So…..I’m going to try them again for my next race and see. As advised by the guys at Totally Fuelled (who by the way will give you 15% off any order if you use the code ‘dutchie’ valid until April 2016) I took one tablet a day 3 days before the race, one 2hrs before the race and 2 tablets during (1 every 4-5 hours of exercise). Only time and a few more races will tell. If you’re looking for a challenge that’s as much awe inspiring as it is demanding then this race is for you. It is not to be taken lightly though with 402 Did Not Finish (DNF) out of 1496 starters gives this race a 26% DNF rate, so even if you consider yourself a serious contender, this race is really about listening to your body and getting to that finish line! 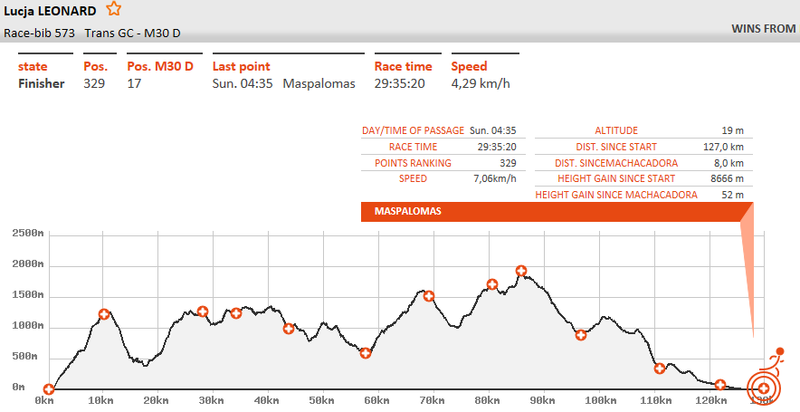 I’ve always looked at the elevation chart before a race but the numbers don’t normally sink in as let’s face it I’m hardly a mountain runner, so when I was studying the finishing times of Transgrancanaria (TG) and the high amount of DNF’s I did start to wonder what on earth I had signed up for this time. Not content with signing up for the Advanced version of 83km I had of course signed up for the big daddy, all 125km with 8,500 of ascent, climbing the height of Everest! TG is part of the 11 races that make up the Ultra Trail World Series and billed as being one of the main highlights on the world stage it didn’t disappoint. 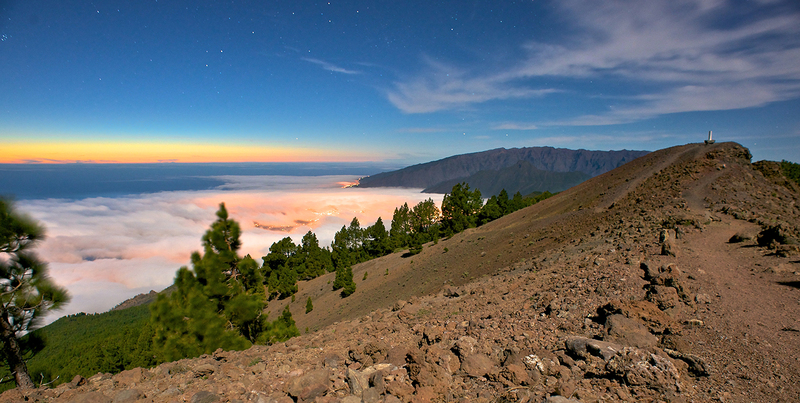 We chose to stay in Las Canteras in the north of the Island as we had a few days before hand as well to relax and it was close to the bus pick up point at La Fuente Luminosa that would take us to the start at Agaete. 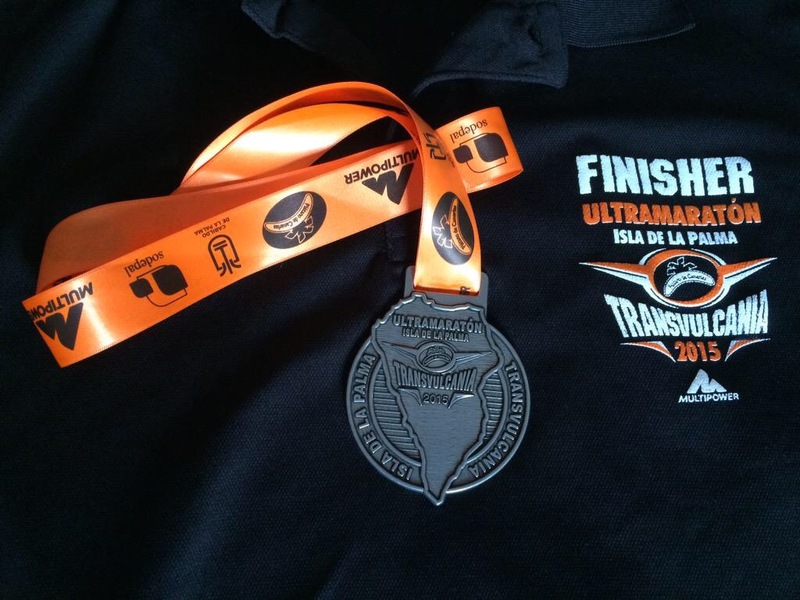 We had sorted accommodation in Maspalomas for the finish to save having to travel back up far after the finish as we were concerned about how we would get transport back up in the early hours of Sunday morning. Dion had come along to enjoy the local trails for some running and acclimatisation before he heads out to Marathon Des Sables in 3 weeks time, and was undecided whether to race or support me in the race. 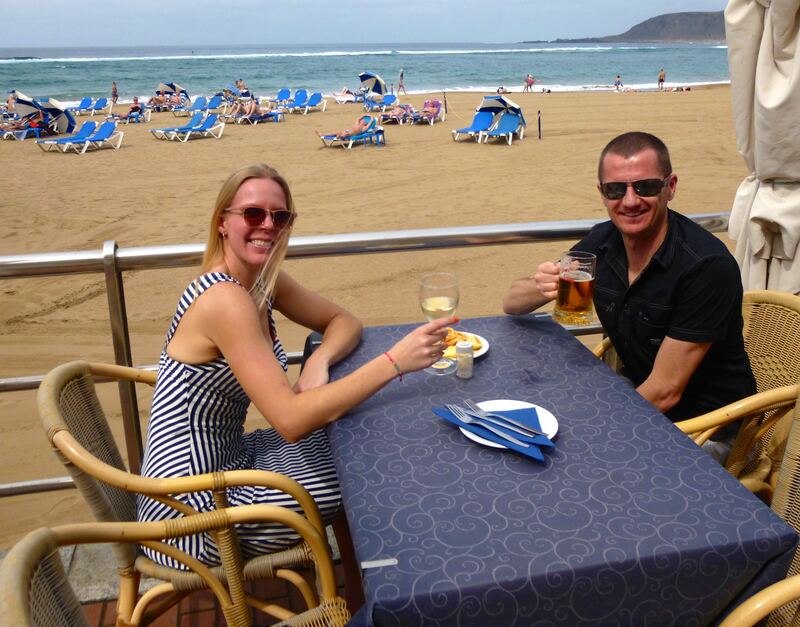 Las Canteras was a beautiful spot with great beaches, full of local culture, some great local trail runs and well away from the cheesy, garish Maspalomas. The race expo at the aptly named Expomeloneras was well organised with brand stalls for runners to buy last minute kit or get enticed to other races that were also being advertised. The registrations were clearly marked with queues in lines of bib numbers for each race, I had no queue time but heard mixed reports from others. Find your number on the wall join the queue, show your ID, and you are sorted. No kit or mandatory kit checks so you don’t need to come or bring all your gear. On registration you were given 2 drop bags (one for Garanon 82km in and one for the finish line). Tip here is to bring your kit for the drop bags with you so you don’t need to come back later that day or next. In my Garanon bag I had a change of shorts, long sleeve top, socks, beanie, spare batteries and some more food (mainly gels & perpeteum). My finish bag consisted of a fleece jumper and chocolate milk. I had grand plans of hooking up with a number of twitter chums that were running the various distances but with the 2 days worth of registrations and 4 different time slots to come along it was difficult to co-ordinate with everyone, I did manage to hook up with Daniel Rowland and Cat Simpson for a chat over some chilled water. 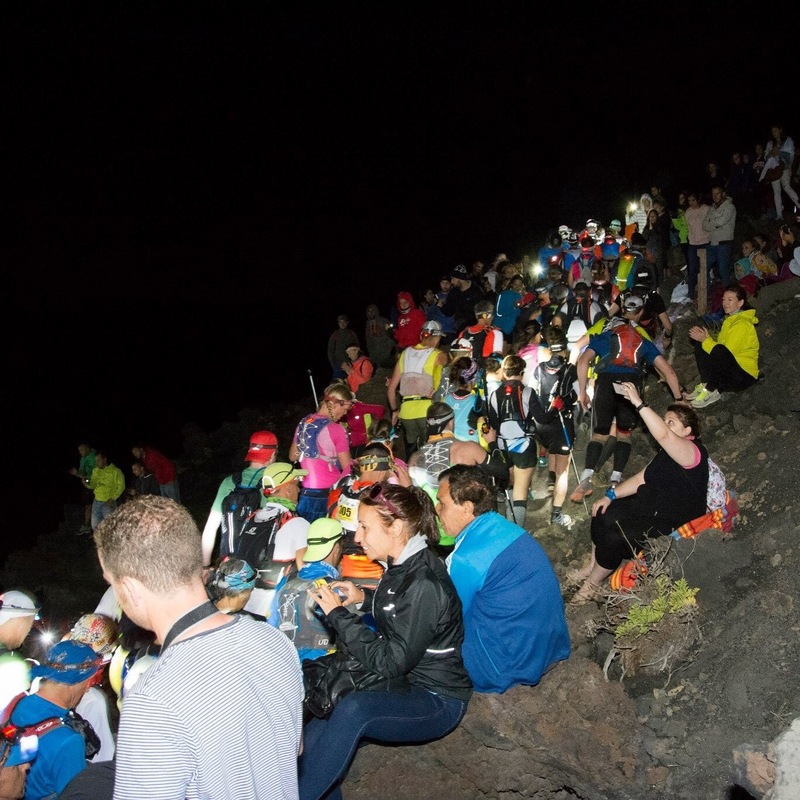 From the registrations which commenced on the Thursday through until the finish line in the early hours of Sunday there was a party atmosphere. The race starts at 11pm on the Friday night so it’s imperative that the day be spent doing as little as possible, eating, keeping hydrated and lazing around trying to get a few naps in. I did this pretty well, had a tasty big bowl of pasta and pizza at about 7pm and felt alert and ready to go at the start line. The bus takes about an hour from La F.Luminosa so I had packed a roll to eat before the start as well to keep the tanks topped up. It was Carnival in Agaete at the start so there was plenty of interesting characters and loud music to build the atmosphere. The elite runners were being introduced as I made our way to the start line and squeezed in a bit too near the back as I’d left it a bit late to make my way into the holding pen, but it’s a long race right?! And we were off! A bit of a jog uphill through the village, no need for head torches yet and then we hit the first long climb up. Trying to avoid all those bloody poles tripping you up, people swinging them around in all directions, who uses poles anyway? Only about 98% of everyone at this race….I wondered why? Switch back trail all the way up for 9km to the first checkpoint which took me 2hrs to reach, it was a steady hike up, there were only the smallest of sections that you could run. It was a sight to behold to see the long train of head torches and flashing red lights snaking up and down the mountainside in the moonlight. The next 2 checkpoints came and went in the dark, I took the uphill slow, and had to take some of the downhill even slower as I am terrible at descending and the terrain was so technical that without a pole (bloody poles) it was hard going. I had read prior to the race not to use the down hills to make up time, but to use it for recovery. Good tip. When I reached the 3rd checkpoint (33.5km in 7.5hrs) Artenara, I found Cat sat at the checkpoint, crying about to pull out. I don’t know if it was the fact that dawn was breaking or I just had to help a runner in need and I became Miss Positivity, cajoled her into coming along, at least until Fontanales the next CP, and we ended up keeping each other company until just before CP8. It was brilliant to watch the sun come up and the villages come to life as we climbed up and up these mountains. The climbs were brutal and I started to think that even the downhill’s on the route description were actually uphill’s as well. There were some nice runnable sections along the way, but the legs were broken so running is a loose term! The CP’s were mixed, very friendly of course, but in terms of food I am glad I wasn’t relying on them, bits of cheese & cold meat along with some bread sticks that had dried out in the wind and some dried fruits that didn’t look too appetising. The highlight was the cola and strong espresso’s they were offering with about 3 sugars in them, rocket fuel! At Cruz de Tejeda the 7th CP I scoffed what was remaining of some salted crisps which were heaven sent. Cat and I parted ways just before CP 8, I wasn’t sure if I was going to see her again enroute but I pushed on to the last final big climb up to Roque Nublo. It was tough too, having been out for about 17hrs already to push through another 1,000m of climbing was hard going but I wanted to push on to get to Garanon before the sunset as that was my ultimate goal as the CP here closes at 7pm, so apart from a couple of photos on the way (it was too beautiful not to) I moved as quick as I could to get there. I made it to Garanon with 10 mins to spare before the CP closed and embarked on a speed eating session of a bowl of oily, salted pasta and changed into a warmer top as it was beginning to get pretty cool again now with the sun dropping. 2 marathons down, 1 marathon to go now right?! 7pm at night and I’d been on my feet for 20hrs. Out of Garanon and straight back into a short but very steep hill and at this point I was joined by Luis, a local runner with whom I had been playing CP tag with all day. He had constantly been telling me how tough I must be for doing this without poles and I had joked that a true gentleman would give me one of his which he now made the point of doing, he knew what was to come next and without the use of one of his poles I think I’d still be stuck up there. Luis was good company had done the 80km version before and could describe in detail what was coming next though maybe you are better off not knowing. After a gruelling descent down what the locals call ‘Quad Breaker’ in the dark the wind was now picking up strongly blowing the dust over from the Moroccan Sahara (called Calima by the locals) straight into your eyes and throat making vision difficult and swallowing even more so. I was getting texts along the way from Dion here telling me the cut off times of each CP which was differing from the information we were getting at the CP’s, we just made Arteara in time after the worst descending experience of my life. Imagine scree but rocks the size of grapefruits, and tonnes of it, on a hill that is so steep you have to lean backwards to stop from tumbling off. Thank goodness I had Luis’ pole to get down that and if ‘Quad breaker road’ hadn’t done my quads in they certainly were now. But no time to rest, another text from Dion indicated that I now had to run 9km in 1h15, we thought we had 1.5hrs. Now that would normally be okay but after so long out and having to still climb up another kilometre before some semblance of a road (dirt track with pot holes and big rocks) it was a big call. But I pushed, boy did I push. Laboured breathing, snot pouring out of my nose with my throat gagging from the Calima and everytime I tried to drink water it was coming straight back out. I saw the time slipping away and all I could see ahead was darkness, there was no hope of making this CP……..and then Dion was there on the side of the track yelling and screaming at me to run, run harder! I don’t know how I did it, I couldn’t have done it without him running beside me but I sprinted as hard as I could for the last few kilometres and made the CP with 3mins to spare! Absolutely in ruins I still had 8km to the finish. Dion knew what was ahead so he kept me in control, telling me that we have to jog gently the next 3km then I could walk for a couple through the river bed, and then I would need to jog again for the last 3km. I couldn’t talk so just nodded and let him lead, grabbing his arm for support now and again as I felt all my strength just disappearing. But sure enough, there was the beach. I could hear the loudspeakers, I was going to finish, actually finish!!! A little jog through the sand to finish off before the home stretch and you could see the finish line and the time. I had just over 20mins to spare so I just cruised it in the last 100m soaking up the cheers of about 20 people still there at 4:30 in the morning on a Sunday and I crossed that line with my arms up high and the biggest smile imaginable on my face! I had done it! Finished! 29 hours 42 minutes. 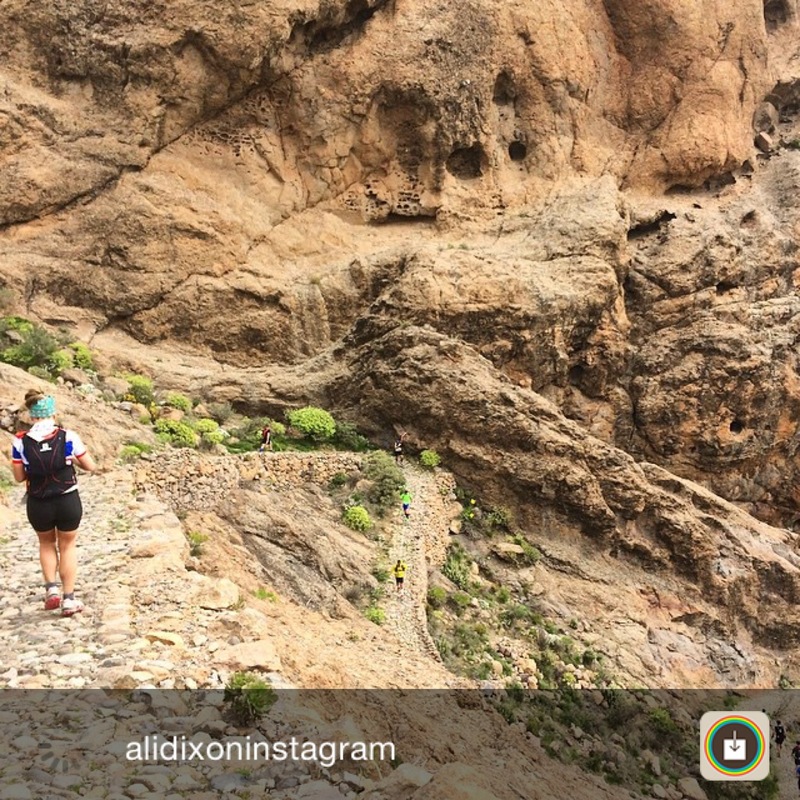 Transgrancanaria is a monster of a race and I have the utmost respect for anyone that even dares to toe the start line of this beast, let alone can make it to the end. There is a high number of DNF’s (262 in total) including some big name runners and that doesn’t just happen for no reason. Prior to the race I had broken the ‘day’ into three goals, get to daybreak, then get to Garanon, then get home! I had also analysed the finishing times although I had no runner to compare to just looking at how long it was taking runners between checkpoints and how many DNF’s there were it was already in my head that I was going to be out for at least 25hrs, without that being in my head I don’t think I would have mentally been able to handle the time on my feet. I loved it! I absolutely loved this race! I would recommend it even as I sit in my chair still a little broken knowing that this is going to take a few weeks to truly recover from it has been a fantastic experience and one where I have learnt more about myself and how strong I can be mentally as well as physically to push my limits even further. And yes, I’ve now bought a pair of those ‘bloody’ poles so watch out for me at Transvulcania swinging them about. Check out my little video here and the official video here. Costs to enter – €140 for 125km race early bird price, rising to €160 euro, plus you need flights to get there (we flew Jet2 from Edinburgh) plus accommodation. 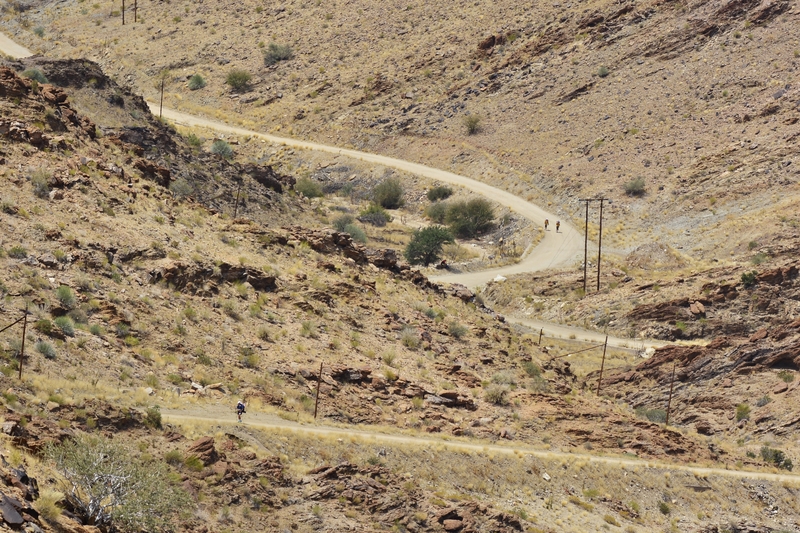 There is something truly unique about the Kalahari Augrabies Extreme Marathon (KAEM)-250km self sufficient race through the desert over 6 stages/7 days that brings you back time and time again. 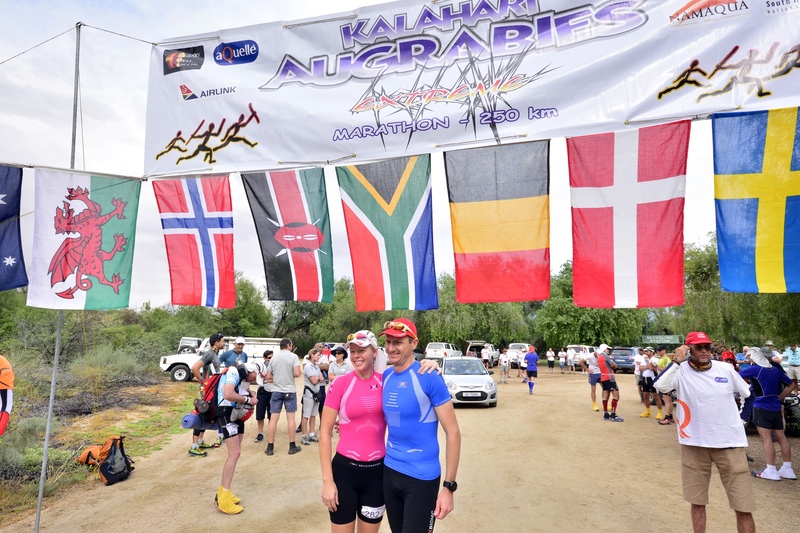 The Kalahari didn’t fail to deliver another exceptional week of stunning beauty, stiff racing competition and fabulous camaraderie. Running alongside such beauty is part of the experience. 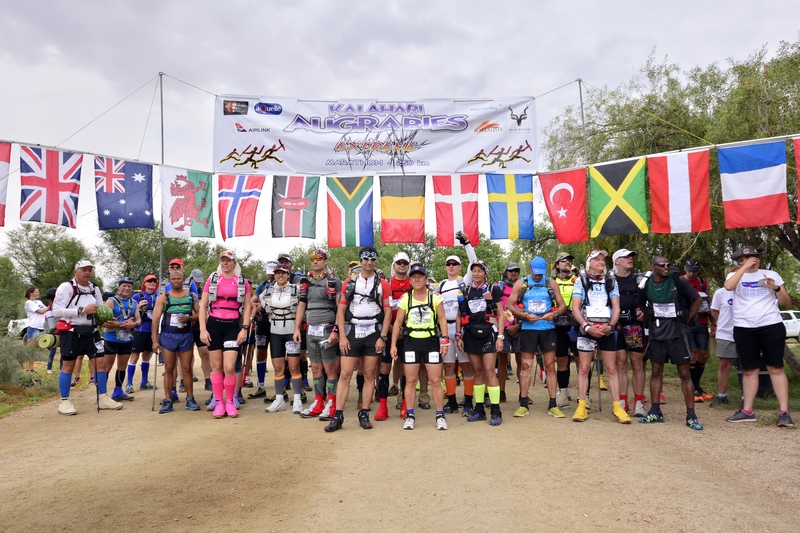 After finishing KAEM in 2013 and having learnt a lot from other races completed this year, including Marathon Des Sables (MdS); preparation had an even more concentrated focus. I analysed my kit & nutrition to ensure there was no room for error and that I had the correct weight to energy ratios with race nutrition being the key. A major learning after MdS was to stop using nuts/low carb foods as fuel during racing hours and converting to high carb fuel such as gels/bars/clif shot bloks and liquid energy such as perpetuem. My nutrition plan worked so much better, nothing is ever 100% but it was close. I will be doing a further blog purely on nutrition in the new year as I’m having my entire weeks food diary analysed which will be interesting to get some further feedback from an expert. 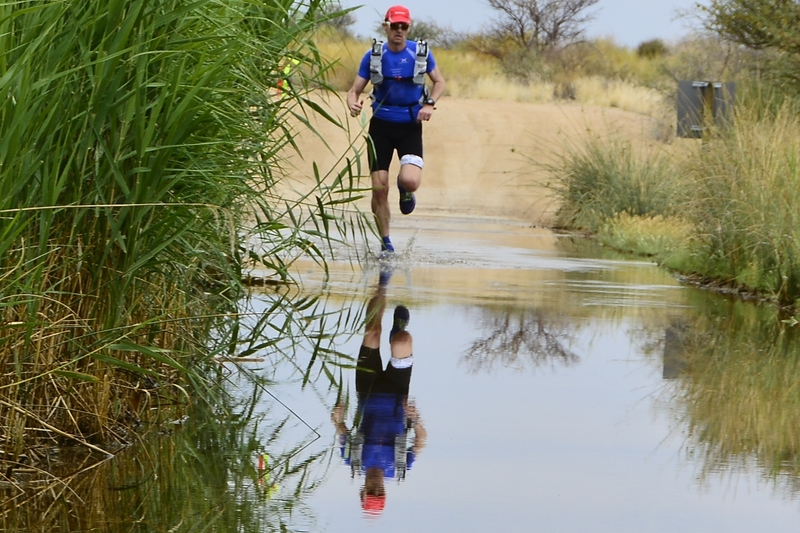 Returning to the Kalahari after finishing 14th overall last year I had the key target of being in the top 10 overall and pushing for the female win. This meant after MDS I had a small recovery period before training and races leading up to this began. Weekends were made up of back to back long runs, little social life, healthy eating, alarms going off at 4:30/5am weekdays to fit training runs in around work. To really ramp things up and to make sure we (my husband Dion was also competing) were as ready as we could be we turned our spare room into a heat chamber by purchasing a treadmill and sealing off the room with 3 big fan heaters and radiator bringing the room up 38 degrees. We ran in here every day for 3 weeks prior to the event for anything from 1 hour to 3 hours with or without our race kit and bag on, with sweat flying everywhere. It wasn’t pretty or fun, and we still haven’t seen the electricity bill so that joy is still to come! All of what we did worked though, we were both the fittest and the strongest we have ever been and I believe the heat acclimatisation helped for sure, when trying to train in the UK at 0-15 degrees for a race in 40-50 degrees it is the only way to do it. Prior to the race I had also been working with Marina Ranger who also ran in 2013 and wanted to go back to better her performance. I am now working on putting together training plans for ultra runners and we were keen to work together to see what results we could get. Marina came and spent a weekend with me in Edinburgh over the summer and we trained together and talked through a lot of ideas and I put together a plan for her, catching up regularly to help motivate and coach. She worked hard through the plan and the results came for her to, coming in 18th overall (5th female) in just over 32hrs, nearly 11 hours quicker than 2013 where she came 37th overall (9th female). 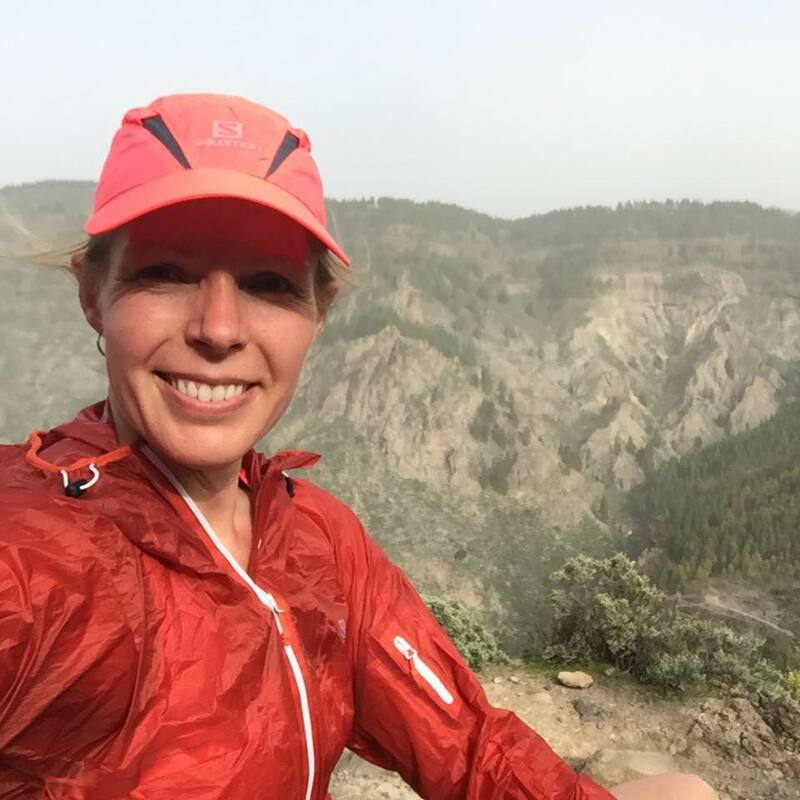 Not only that but she has picked up the competitive bug and we are now working on a plan together to get her ready to compete for Transvulcania in May 2015 with me. With 70 runners registered to compete this year in the 15th edition of the race and the field looking strong, I started eyeing off the competition from arrival at the transit hotel in Jo’Burg. 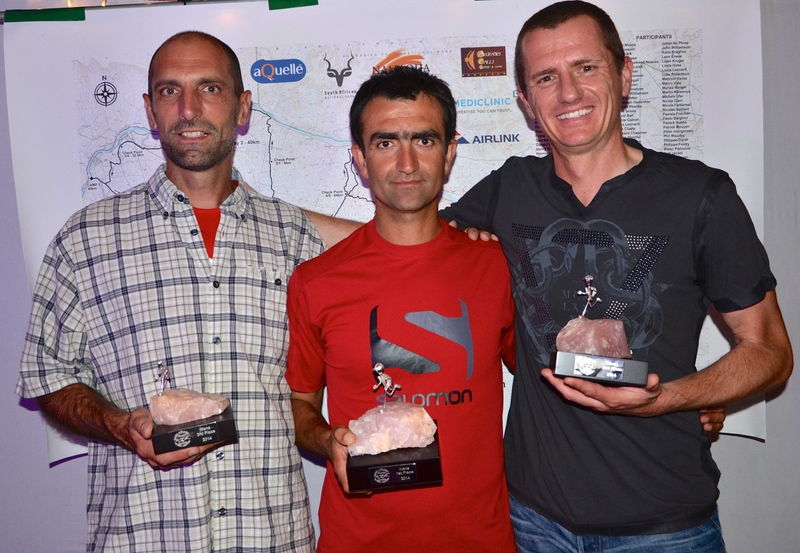 By the time we had all flew over to Upington, I was starting to wonder if it would even be possible to better my 14th overall placing from last year, these runners looked like they meant business. It was fabulous to see a lot of familiar faces, including the ever welcoming race organisers Nadia and Estienne. There was quite a group of us from last year’s event that had returned for more fun in the sand and sun along with many newcomers I would get to know well over the week ahead. The first two nights pre race are spent at the Augrabies Falls Lodge giving all the competitors time to get to know each other over 2 dinners and Friday is race briefing, kit and medical checks where we all compare the sizes of everyone’s bags (I’m using the Raidlight Olmo 20L which I had used at Marathon des Sables earlier this year). I’m confident with my preparation and planning and a bag starting weight of 6.4kg so leave these discussions to the others and begin to concentrate on tomorrows start. Runners congregate at the start. Race day arrives with the runners congregating at the start line amidst an electric atmosphere filled with pre race nerves and excitement. Our morning had kicked off with our own excitement when one of the local baboons tried to come into our room at 6am via the window, that could have been an interesting situation had he made it and scoffed all my energy bars! 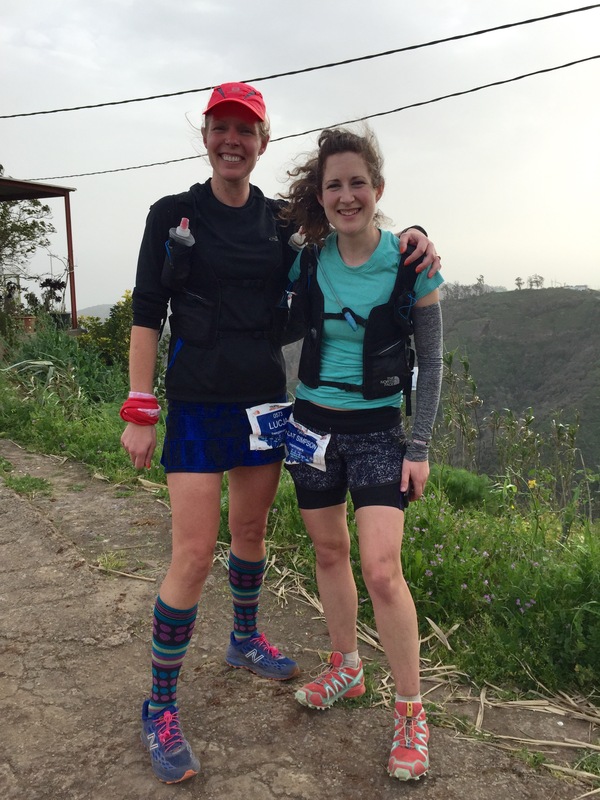 It’s always interesting to see what people are wearing, with X-Bionic, Raidlight and Salomon a common choice. I’m kitted out in X-Bionic marathon shorts and a bright pink Trick shirt, Raidlight desert hat, Injinji toe socks (under my knee length socks which are not compression but more to keep the sun off) and New Balance Leadville shoes covered with my bright pink gaiters from AR Racing, this combination works for me with no blisters on my feet and no chafing in the nether regions to cause discomfort. After a few final words of luck the race starts with a cheer. We may be running through the desert but the race starts off with a couple of river crossings to get your feet wet and a few of us have trouble even staying on out feet with hubby Dion taking a quick fall in the 3rd river crossing trying to keep up with the leaders. Dion making his way through the river crossing. The field spreads out pretty quickly and I focus on running my own race and not getting caught up in anyone else’s pace. 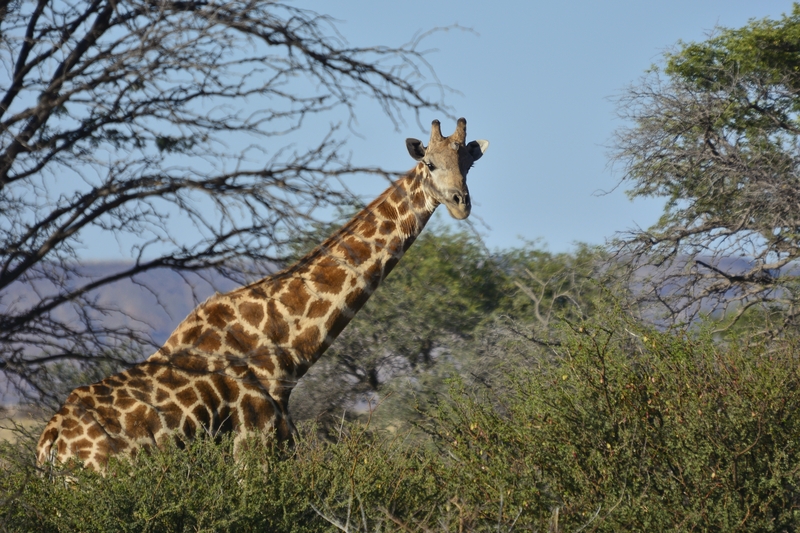 The route is well marked with markers every 200-400m along the route but you do need to keep your head up to make sure you don’t miss these along some of the sections, as well as making sure you spot any wildlife, 2 giraffes greet us only a few kilometres into day 1, this is what it’s all about. It’s straight into action on day one with some tough technical sections to run along a river bank made up of soft sand and massive boulders for a few Km’s and finishing with long steep inclines to really get the legs working. 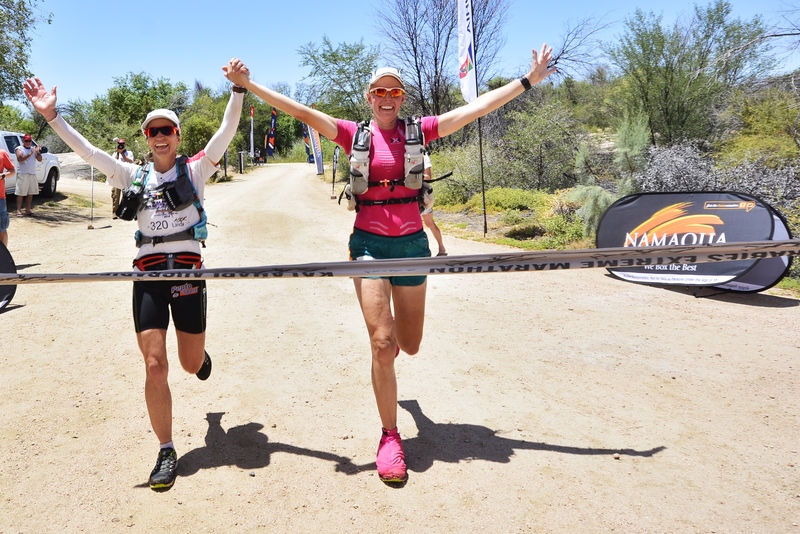 I get in on day 1 after 25km in 2h57 and in position 8th overall, 2nd lady with just 6mins separating me from Linda Doke (Salomon sponsored athlete from South Africa) my main rival for this race. Dion does well coming in 4th in 2h36. My strategy worked well today, maintaining my own pace & eating every hour along with a salt tablet and focussing on keeping the water intake up. After an interesting night in a full blown African storm, where the heavens opened up we all finally managed to get some sporadic bits of sleep ready to face a new day. With the mix of the rain sodden ground and the Kalahari heat the biggest challenge of Day 2 was the overwhelming humidity. With 35km to tackle today it turned into the day I truly questioned myself; my abilities, my motivation, my mental strength with me feeling serious discomfort all through the stage and a complete lack of energy. I held onto my 2nd lady position, but actually came in 3rd lady for the stage with both Linda and Bakiye ahead of me. A time of 4h9 I finished 12th for the stage. Dion seems to have an equally rough day out there finishing in 3h41 maintaining his 4th position after a gruelling day. Some of the terrain along the way. Yet again we spent a night of wet weather with a stunning lightning storm to keep us on our toes, with the earlier starts for Day 3 starting in the rain, luckily the skies cleared and we were able to head off for the 40km stage. A stunning mixed route of gorges, massive rock walls and sandy river beds motivated me to no end and after my tough day yesterday I was stoked to be feeling strong and on fire today. I was 100% focussed today and this was very apparent in my running style and my results, coming in at 4h21 as 1st female (5mins ahead of Linda) and 6th overall. I felt so strong and happy when I crossed the line I was fist pumping the air and felt like I could have run it again! 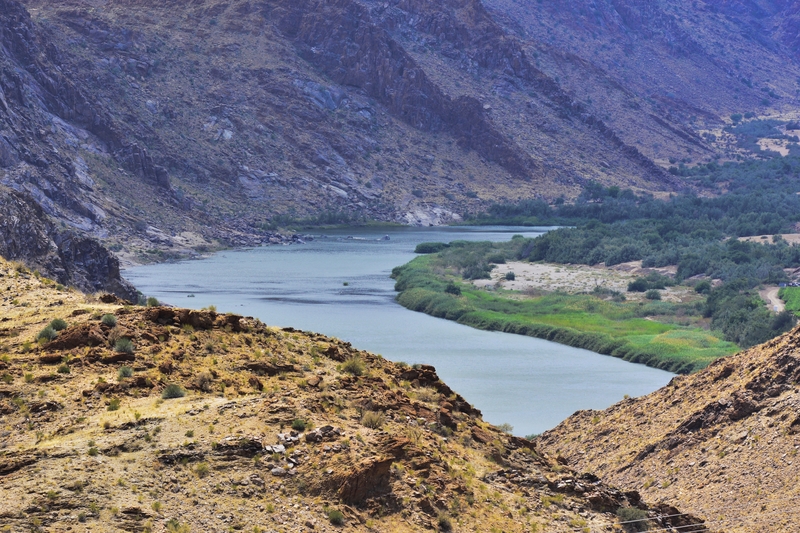 A gorgeous camp spot awaited me as well, on the banks of the Orange River, so after a refreshing dip and wash I was feeling on top of the world and ready to face the long stage the following day. Dion had a tremendous day as well coming in 3h44 and not only smashing 2nd place for the stage but moved up to 2nd overall. The long day was 70km and was made up of all the runners leaving in waves of staggered starts, the first group leaving at 6am, I left at midday and Dion was in the last group (of 2) which left at 1pm. Leaving in the heat of the day felt like the worst option after sitting around for hours seeing everyone else head off wishing you could get started, but I guess the bonus is it’s not as long until the sunsets. I was in a group with Bakiye (previous winner) who was currently 3rd lady but without the leader Linda, so I wouldn’t know how we were placed until the end of the day. I felt strong again and pushed hard as this was the day in my mind I truly wanted to smash. I reached the 1st & 2nd checkpoints before Bakiye but then got lost in a gorge, losing about 15mins easily, and finding myself having to chase Bakiye down again which I managed before the 3rd checkpoint. I was angry with myself but I had to try and control my anger as this could waste too much energy and lose the mental control that you need in a stage like this, so after screaming at the sky with a few expletives I decided what will be will be and just get on with it. I’d been passing the back runners since checkpoint 2 and was using the next figures in the distance as race figures to catch them up as soon as possible, so I was flying. 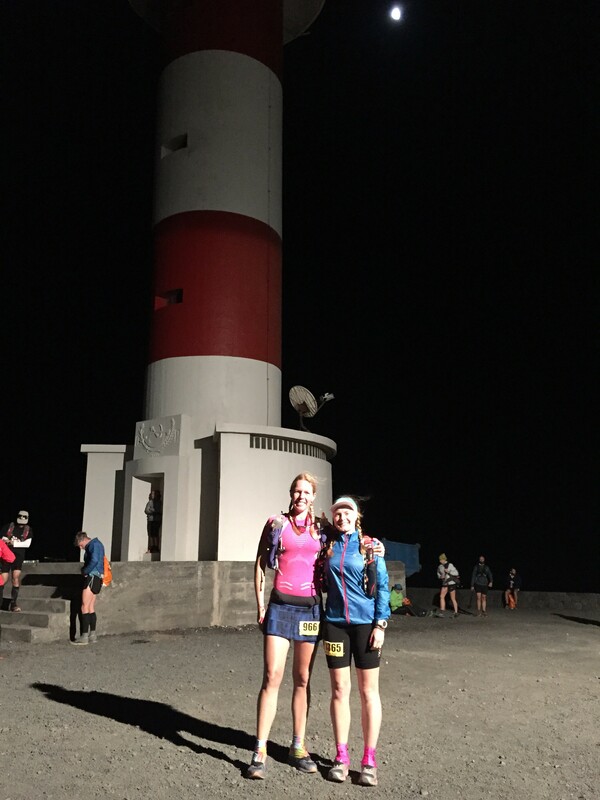 I only needed to put my head torch on after the last checkpoint and made it back to camp utterly spent in 8h29, 1st female by 18mins and 5th place overall for the stage! A double happy day with Dion also smashing it in 6h54 in 2nd overall, only 2 mins behind the race leader Mahmut for the stage, which now put him firmly in 2nd place overall. The rest day is a great opportunity to spend some time catching up with others, having a swim or two in the river and eating, and eating. I’d made sure I’d planned a big day of food, lots of small snacks to keep me busy and completely refuelling after 4 full days of hard racing. With a marathon and a half to go, the end was starting to seem real. Linda & I enjoying the rest day in the Orange River. With a mere 8 minutes overall separating me from Linda, today was make or break for the lead. Linda pulled ahead of me quickly from the start, my legs were really feeling it and I was in admiration as I watched the small group of runners she was in pull gradually away from me. It was a tricky, technical day with temperatures soaring up to 42 degrees for the day. The route had a bit of everything thrown in for fun and it really became a challenge to finish the day. It is always a tough mental challenge on the 2nd last day as mentally you are preparing to finish, but the desert hasn’t finished with you yet. As tradition would have it (2 years running now makes it a tradition) I finished the day dehydrated and with a good cry, heat & exhaustion will do this to a woman! The heat in the camp was relentless that afternoon and there were some temperatures fraying in a number of runners, none of which you can take personally, that’s just the name of the game after such a tough day and week. Linda and I had a chat, with 35mins separating her from me as the leader we both knew I wouldn’t be able to make that up on a half marathon distance the following day and happily agreed that we would run the last day together, neither of us were at risk of losing any overall position and we wanted to have just one day of taking it easy and chilling out. Linda was a deserved winner and it was an honour to race against her and learn from her during the week. 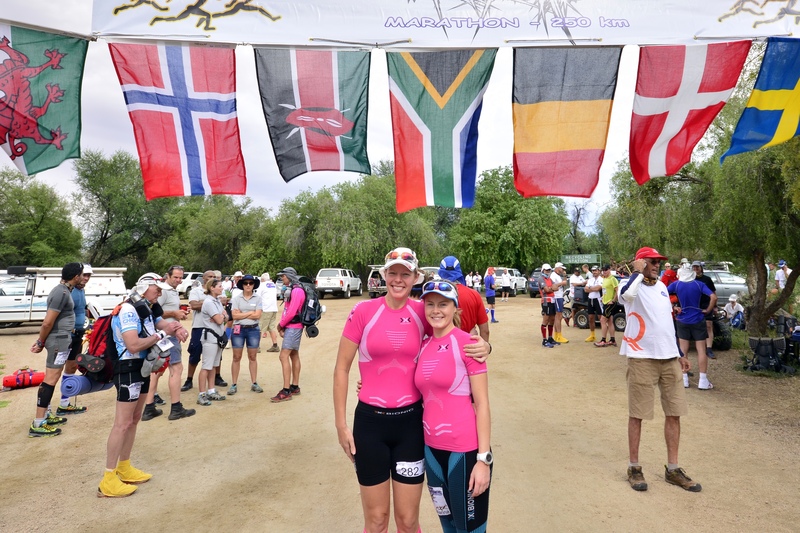 We enjoyed every step of the last day to the 26k finish line enjoying the stunning scenery including a small herd of springbok bouncing directly through our path, and soaked up every minute of crossing the finish line together triumphant, hand in hand. A cold beer awaited us at the finish and I was in a quandary as to whether to have beer first or jump in the pool first. The beer won out, but not by much as I quickly jumped in the pool beer in hand in full kit, lovely! Linda & I cross the final finish line. 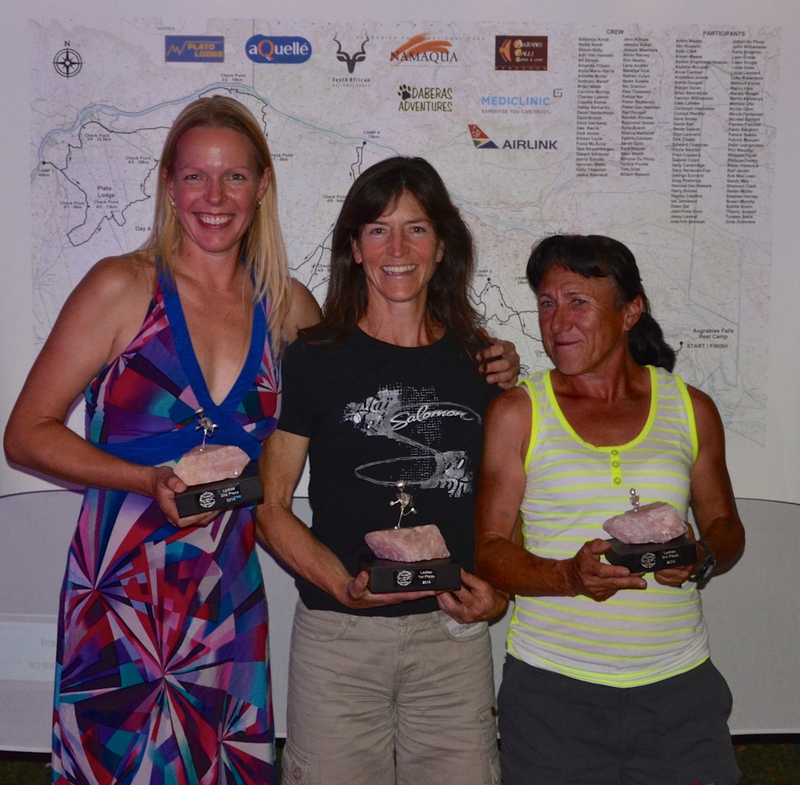 A fantastic week long race full of challenges and excitement, finished off with a day to relax at the Augrabies National Park ending with a superb evening awards ceremony where every runner receives their glass blown leopard trophy, each to their own round of applause and their own moment of fame. 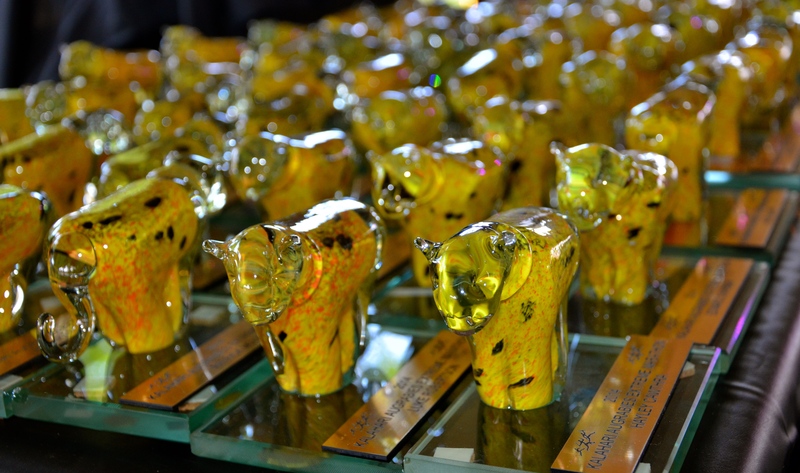 A herd of glass blown leopards ready for the prize giving. Dion and I walked away with 2 trophies, with Dion 2nd overall and me coming 8th overall & 2nd lady (improving my time from last year by 5 hours), we received an additional trophy made out of rose quartz collected from the very desert we had just run through and a handmade silver pewter runner on top. This now makes 2 of these trophies for me and they both sit pride of place on our mantle piece together.